This was Kelly's swap from our last Millet meeting. Kelly is one of my downlines and does amazing cards and projects. If you're in St. Albert, check out one of her classes. I would be happy to pass along her number. She used the Elements of Style stamp set from the Summer Mini catalog. 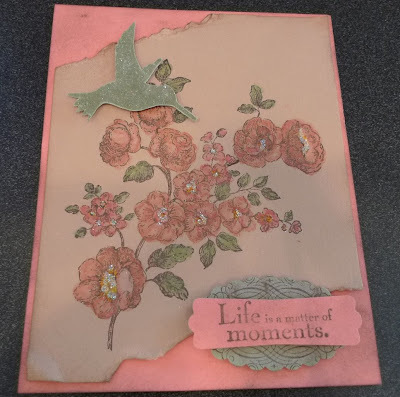 I love how she stamped the main image on Creamy Caramel card stock and colored it in with ink and a blender pen. Each flower has a touch of Dazzling Diamonds glitter in the center. The hummingbird was stamped with Versamark ink on Mellow Moss card stock and embossed with Iridescent Ice emboss powder.